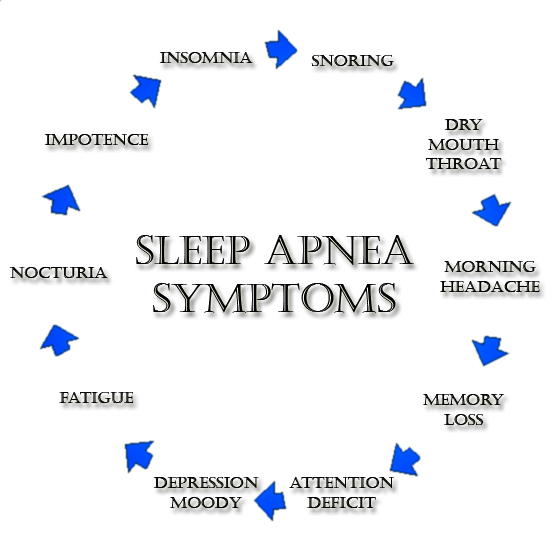 Sleep apnea is a disorder characterized by a reduction or pause of breathing (airflow) during sleep. It is common among adults but rare among children. Although a diagnosis of sleep apnea often will be suspected on the basis of a person’s medical history, there are several tests that can be used to confirm the diagnosis. The treatment of sleep apnea may be either surgical or nonsurgical. Apneas usually occur during sleep. When an apnea occurs, sleep usually is disrupted due to inadequate breathing and poor oxygen levels in the blood. Sometimes this means the person wakes up completely, but sometimes this can mean the person comes out of a deep level of sleep and into a more shallow level of sleep. Apneas are usually measured during sleep (preferably in all stages of sleep) over a two-hour period. An estimate of the severity of apnea is calculated by dividing the number of apneas by the number of hours of sleep, giving an apnea index (AI in apneas per hour); the greater the AI, the more severe the apnea. A hypopnea is a decrease in breathing that is not as severe as an apnea. Hypopneas usually occur during sleep and can be defined as 69% to 26% of a normal breath. Like apneas, hypopneas also may be defined as a 4% or greater drop in oxygen in the blood. Like apneas, hypopneas usually disrupt the level of sleep. A hypopnea index (HI) can be calculated by dividing the number of hypopneas by the number of hours of sleep. Sleep apnea is formally defined as an apnea-hypopnea index of at least 15 episodes/hour in a patient if they do not have medical problems that are believed to be caused by the sleep apnea. This is the equivalent of approximately one episode of apnea or hypopnea every 4 minutes. High blood pressure, stroke, daytime sleepiness, congestive heart failure (low flow of blood to the heart), insomnia, or mood disorders can be caused or worsened by sleep apnea. In the presence of these conditions, sleep apnea is defined as an apnea-hypopnea index of at least five episodes/hour. This definition is stricter because these individuals may be already experiencing the negative medical effects of sleep apnea, and it may be important to begin treatment at a lower apnea-hypopnea index. 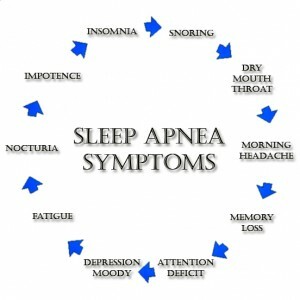 It can be tough to identify sleep apnea on your own, since the most prominent symptoms only occur when you’re asleep. But you can get around this difficulty by asking a bed partner to observe your sleep habits or recording yourself during sleep. These sleeping disorders can have a profound effect on everything from driving a vehicle to school or work performance, to relationships with family and co-workers. Leaving a sleeping disorder undiagnosed and untreated not only affects your life, but also those around you. Your own health is jeopardized by increasing the risk of high blood pressure, stroke, heart disease, immune system damage and causing early morning headaches and daytime sleepiness. Others around you, while driving can be placed at risk by your fatigue and inability to concentrate and mood swings. Of course there is also the lack of sleep your sleeping partner may be experiencing due to chronic loud persistent snoring, choking or gasping for air, witnessed pauses in breathing, restless sleep and frequent bathroom visits. To identify possible correctable airway problems the patient will receive a sleep study which can be done at his/her home or in one of our branches mentioned above. The data of the sleep study and an specialist ENT medical examination, where indicated, are analysed and an individualized treatment plan will be constructed. This may include corrective upper airway surgery, CPAP mask and an assisted weight loss program if indicated. By combining the services of ENT surgeon and the data obtained from state of the art sleep studies, “Silent Sleep Clinic” can identify and treat the causes of snoring and sleep apnea (breath holding during sleep) and so doing improve our clients health and quality of life. For further information please contact us and allow us to make a difference.